Recent droughts associated with climate change have had immense negative effects on food production in Australia. Australia is an important producer and exporter of livestock, dairy, and wheat. Much of the wheat produced is exported to Indonesia, Japan, South Korea, Yemen, Vietnam, and China. The Murray-Darling Basin is one of the main agricultural areas in the country, contributing 40% of Australia’s gross value of agricultural production. Water scarcity is accompanied by a high demand for water for both agricultural irrigation and non-agricultural uses (Quiggin and Chambers 2004). Therefore, it is necessary for crop producers to adopt new strategies to mitigate the impacts of drought. Some of these strategies include land use changes and introducing drought tolerant crop varieties. Qureshi et al. (2013) aim to use the Australian Bureau of Statistics (ABS) data and modeling to explore the possible future effects of Australian water shortages and the broader impact on global food security. Through a hydro-economic stochastic modeling approach, they determined that decreases in water availability due to climate change ultimately lead to shifts in the types of agricultural products being exported, increases in food prices in developing countries, and loss of capital investments such as orchards and plantations. Qureshi et al. examined the impacts of water scarcity in Australia using a positive mathematical programming integrated hydro-economic stochastic model based on four scenarios regarding climate change: a base case scenario, a dry scenario, a medium scenario, and a wet scenario. All four scenarios used in the 111-year simulation were developed by CSIRO (2008) and included four distinct categories of water allocations. These categories included a very low or dry state of nature (12% of driest years), a low or dry state of nature (next 38% of dry years), a high or wet state of nature (the next 38% of relative wet years), and a very high or wet state of nature (the next 12% of the wettest years). Qureshi et al. focused on agricultural activities, such as rice, cereals, dairy, sheep, beef, grapes, and horticulture. They also used comparative analysis to consider five treatments regarding irrigator adaptations to climate change: no on-farm adaptation (Treatment 1), on-farm adaptation takes place (Treatment 2), on–farm adaptation and the most efficient irrigation systems are used (Treatment 2a), both on-farm and off-farm adaptation take place (Treatment 3), full adaptation takes place and cereal and rice prices increase by 100% and 50% respectively (Treatment 3a)(ABS, 2011). They compared the impact of water allocations, crop effective rainfall, crop evapotranspiration and irrigation water salinity for the base case scenario to that of the dry, medium, and wet scenarios under the no on-farm adaptation (Treatment 1). They then estimated the mean irrigated agricultural production for each of the four climate scenarios under the Treatment 3 and 3a conditions. Qureshi et al. determined that with no on-farm adaptation (Treatment 1) total mean expected irrigated area in the Murray-Darling Basin decreases by 31%, 7%, and 3% in the dry, medium, and wet scenarios, respectively. The production of rice was estimated to be reduced in area by 10–20%, and irrigated areas were expected to be reduced by 3–7% in the climate medium and wet scenarios. There was an estimated reduction in irrigated areas for the production of all of the major agricultural activities. The model predicted that there would be an estimated 3 million ton decrease in the production of pasture-related commodities, which include wheat and rice. Under on-farm and off-farm adaptation (Treatment 3) the model predicted irrigated agricultural production of all the major activities, except rice, to increase. Under treatment 3a, the price of wheat and rice were increased. Under this scenario, the model estimated wheat production to increase by 20% and rice production to remain unchanged at 98%, 41%, and 7% under the dry scenario, medium scenario, and wet scenario, respectively. Wheat and rice are two of Australia’s major agricultural commodities. Through modeling, Qureshi et al. determined that a decline in the wheat production in one Australian state correlates with wheat production declines in other states. Under the dry scenario, rice production is estimated to be reduced by 70% compared to the base year, 2005–06. Also, the model estimated that rice exports will increase by approximately 250% under the medium scenario and 330% under the wet scenario compared to the dry scenario estimates. Changes in food prices affect households differently, depending on their income level. Poorer households tend to be more intensely and quickly impacted by increases in food prices compared to more wealthy households that are not as dependent on foods, such as imported rice. The modeling conducted by Qureshi et al. indicates that production of agricultural commodities, export of these commodities, and product prices are sensitive to climate change-induced water scarcity. Under a climate dry scenario, they estimated that irrigated land for rice production, as well as rice exports, would be severely reduced. These reductions in exports directly negatively impact the global food market. Rice production has high water requirements, and, therefore, production did not increase under the increased price treatment. On the other hand, the model indicated that wheat production would increase when prices were increased (Treatment 3a). 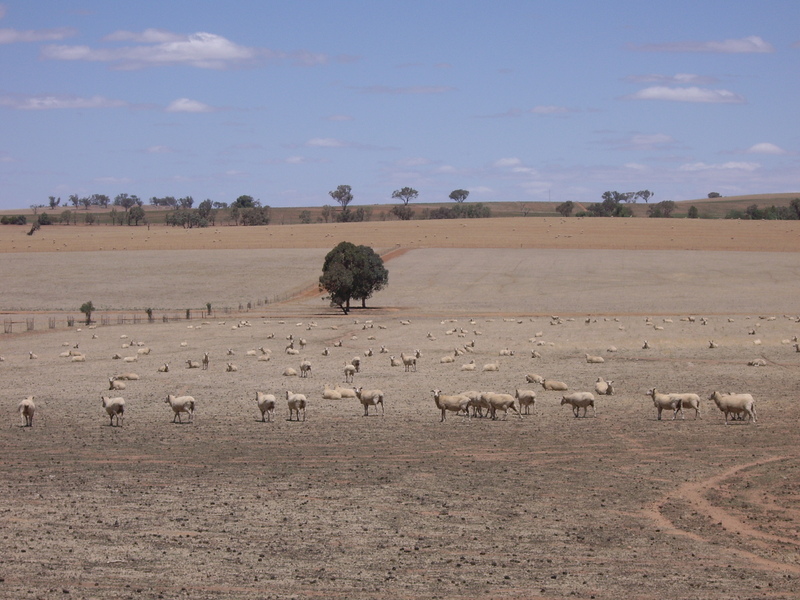 Rainfall patterns and other forms of water allocation pose substantial threats to agricultural production in Australia, as well as to food exports to other parts of the world. Quiggin, J., Chambers, R.G., 2004. Drought policy: a graphical analysis. Australian Journal of Agricultural and Resource Economics 48, 225–251. ABS2011. Gross Value of Irrigated Agricultural Production, 2000–01 to 2009–10 Australian Bureau of Statistics, Canberra. This entry was posted in Agriculture, Climate Change, Drought, Food security, Shelby Long and tagged Australian food exports, Charles Sturt University, Climate change, CSIRO Ecosystem Sciences, Drought, Economic model, Fenner School of Environment and Society, Future Directions International, Global food security, International Water Management Institute (IWMI), John Ward, M. Ejaz Qureshi, Munir A. Hanjra, Water scarcity by Emil Morhardt. Bookmark the permalink.